Good Wednesday evening! The severe weather threat tonight is over, as instability levels continue to decrease. There’s plenty of speed shear over our area, but high shear with weak instability can disrupt a thunderstorm’s updraft. You’ll get more of disorganized thunderstorms. While a band of showers and weak thunderstorms move across the area tonight, don’t be surprised to see some lightning at times and a period of moderate to heavy rain. I do not see any indication of anything becoming severe tonight. Plus, the upper air dynamics have lifted well to the north of Alabama by this point. As I like to say when a severe weather event ends… “And another one bites the dust.” With an old stationary front hanging around over the next 18 to 20 hours, look for periods of showers and thunderstorms at times through the rest of the night and during the day on Thursday. Don’t expect rain all day. This activity will come and go; it’s impossible to tell what time it will rain at your house tomorrow, so keep the rain gear handy all day. It will be a very warm and muggy day, with highs in the upper 70s. If a little sun can peak out at times, some spots could reach 80. I think there’s a better chance of spots reaching 80 on Friday. Once a warm front lifts north of the area early Friday, some sun will arrive at times. This will take the best rain chances north of the area during the day. We could still see an isolated shower or storm, but the atmosphere will be capped off for much of the day. I expect the cap to break during the mid to late afternoon hours as some large scale lift moves over central and west Alabama. This will allow storms to develop ahead of a squall line. While the best severe weather parameters will remain over north Alabama and Tennessee, there is still a good mix of shear and instability across our central counties. If cells are able to form out ahead of the main line Friday afternoon and evening, they stand the best chance of producing damaging winds, hail and tornadoes. We will know much more about the severe weather ingredients tomorrow morning, so be sure to look for a full update. Meanwhile, I think this will be a fairly robust storm system that has the chance of producing widespread severe weather across central Alabama. 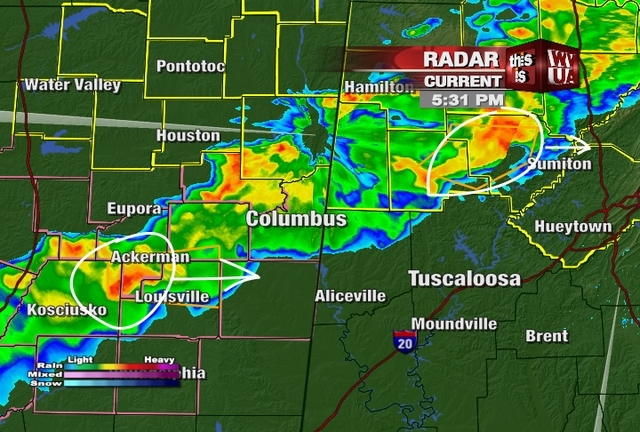 The main threat will occur near and north of HWY 80 and an even higher threat will occur north of Interstate 20/59. The threats include damaging winds, hail and isolated tornadoes. As for the time frame, storms could start in our northwest counties as early as 3pm and end in southeast Alabama Saturday morning. Model data is still questionable on the exact timing of this event. Data does decrease instability values after midnight, so that would reduce our risk as we approach the daylight hours. A squall line will bring an end to the threat gradually from northwest to southeast through the night. There is an outside chance of a secondary surface low developing over Tennessee. If that does happen, our tornado threat may actually increase a bit. There are still a lot of questions regarding the chance of that happening. Again, I’ll have much more on that idea tomorrow morning. The Storm Prediction Center has much of central and north Alabama under a slight risk, with higher chances north of Interstate 20/59. The SPC will come out with a new update late tonight. 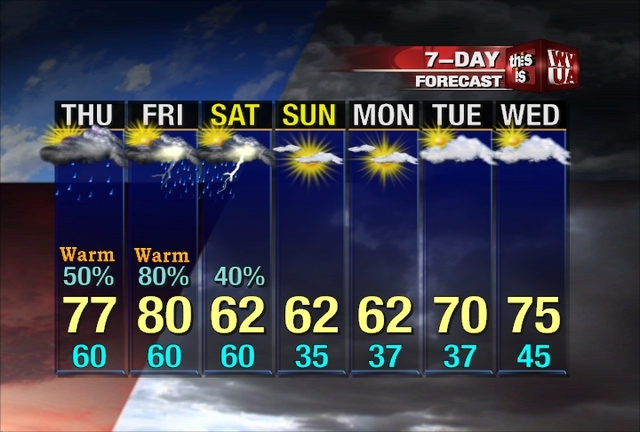 Temperatures will cool a bit once the front passes central Alabama late Friday night or Saturday morning. Highs will fall into the lower 60s Saturday through Monday afternoons, with lows in the 30s. Skies will also become sunny during the day Saturday and remain sunny through Monday. A quick warming trend is likely on Tuesday and Wednesday, with highs in the 70s. Storms Weakening as Night Falls – Wednesday 7:30 p.m. The across Alabama and Mississippi continue to weaken now that we have lost the heating of the day. Instability factors are weakening across the area and keeping the storms from becoming more developed. We will still see some rain showers across the area, so if you are going to be out driving make sure to watch out for the wet roadways. The chance for us to see any severe weather is going down as the temperatures drop, but we cannot rule out the possibility that a storm could reach severe criteria. The good news is that the front is just about through the area and the threat will be completely out of here around the 11pm timeframe. Above is the latest radar look as of 6pm. 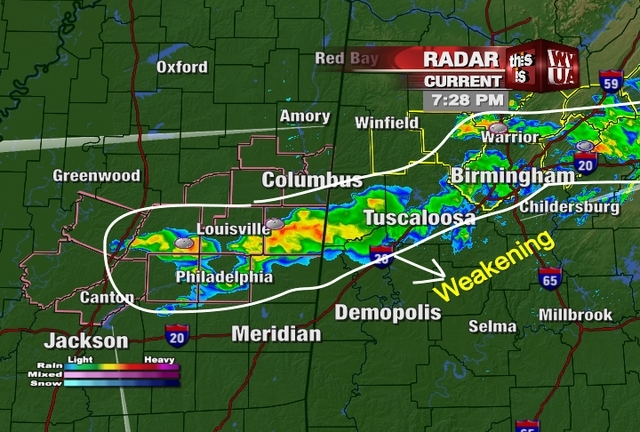 A line of showers and storms are moving southeast across our area and is weakening. We had a tornado warning earlier, but that warning has expired. 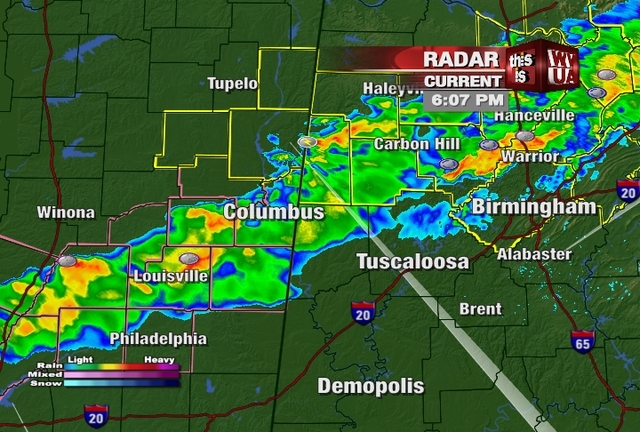 We are still watching some strong to severe storms just west of Pickens County. 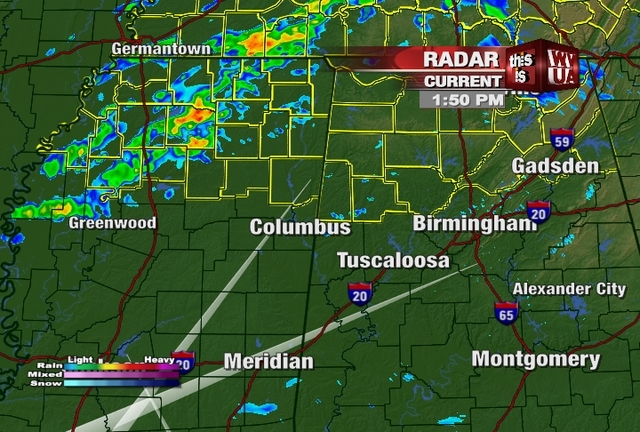 These storms may hold their punch as they move into west Alabama, so remain severe weather alert through 11pm tonight. The threat is starting to trend down now, but an isolated severe storm or two is still possible in the area I’ve shown above. The threat of damaging winds and lightning is possible. 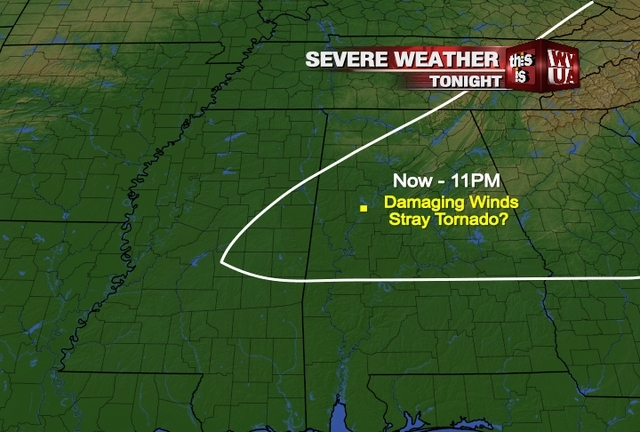 A stray tornado is still possible through 11pm. While there is still a tornado watch until 9pm for our northern counties, the threat is really starting to shift south of the watch box. The southern extend of the watch includes Lamar, Fayette and Walker County. At this point, it’s unlikely that another watch is issued to the south. The reason the threat is decreasing is due to decreasing instability and the upper air dynamics shifting well north of the area. There’s just not much to get the storms growing past severe limits. If anything crazy changes, we’ll quickly update you. 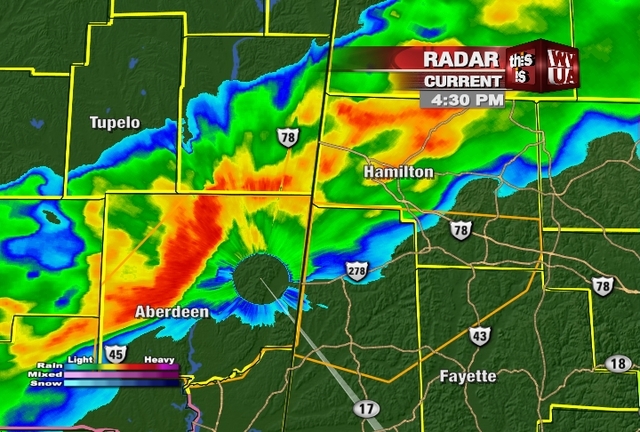 We still have a severe thunderstorm warning for Fayette and Walker County until 5:45pm on this Wednesday. It looks like we’ll catch a break for an hour or so before another batch of severe storms move into the area. 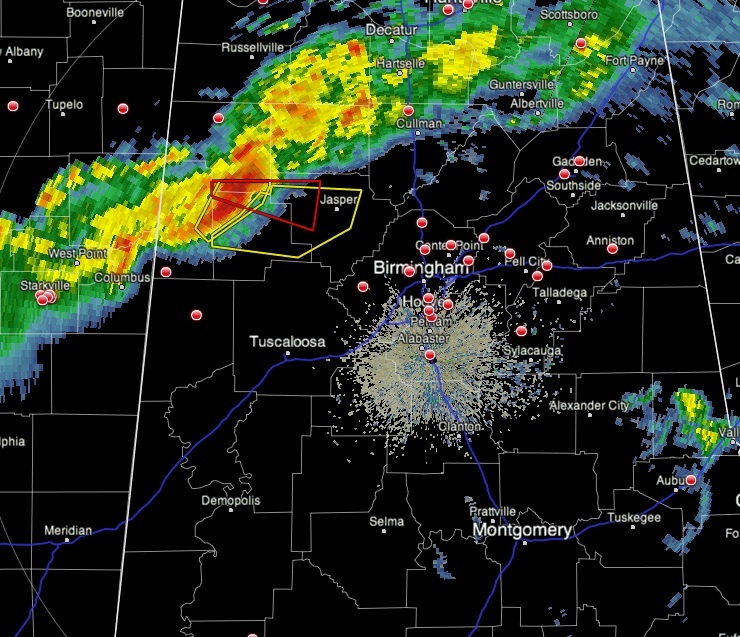 I wouldn’t be shocked if we have another quick round of severe weather with a storm moving towards west Alabama. If this storm holds together, it will impact Pickens County after 6:30pm. As a cold front moves in from the north and stalls, the threat of severe weather will decrease after midnight. This broken squall line will likely start to weaken after sunset, as temperatures gradually cool and instability decreases. Stay severe weather alert through midnight incase a storm become severe or tornadic over your area. Another round of severe weather will arrive Friday night. That threat looks to be a bit higher. More thoughts on that to come. Also, you can scroll down to my morning weather udpate on Friday’s threat. CEDRUM AREA...TOWNLEY...HOLLY GROVE AND LUPTON. * AT 429 PM CST…THE NATIONAL WEATHER SERVICE INDICATED A LINE OF SEVERE THUNDERSTORMS CAPABLE OF PRODUCING DESTRUCTIVE WINDS IN EXCESS OF 70 MPH. THESE STORMS WERE LOCATED ALONG A LINE EXTENDING FROM 6 MILES SOUTHEAST OF SMITHVILLE TO 8 MILES NORTHEAST OF ABERDEEN TO ABERDEEN…AND MOVING EAST AT 60 MPH. WINDS OF 70 TO 80 MPH WILL UPROOT TREES…DOWN POWER LINES AND CAUSE DAMAGE TO HOMES AND STRUCTURES. THIS IS A DANGEROUS STORM. IF YOUR ARE IN ITS PATH…PREPARE IMMEDAITELY FOR DAMAGING WINDS AND DEADLY CLOUD TO GROUND LIGHTNING. The Storm Prediction Center has placed north Alabama under a tornado watch until 9pm tonight. While the tornado threat is rather low, conditions are favorable for a spin up tornado or two for areas north of I 20/59. 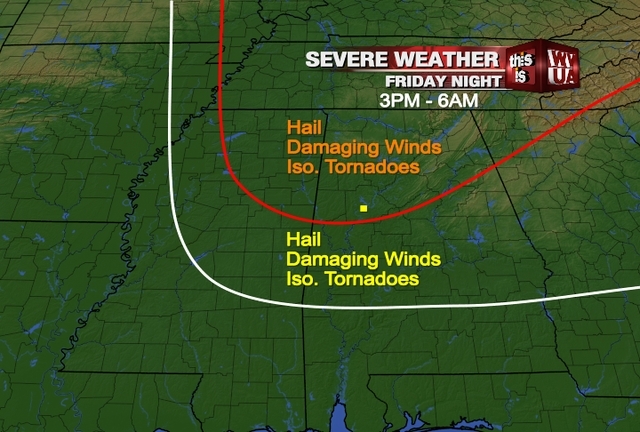 The best chance of tornadoes will occur across the Tennessee Valley of north Alabama.